I look back at this year and I think of myself as a circus performer balancing plates on my fingertips, toes and nose. Those plates represent data collection, conference papers and presentations, thesis writing and serving the postgraduate community. At times, some plates were spinning slower than others, but none of them came crashing down. I could be extolling the virtues of productivity, but I have to concede all that scheduling and compartmentalising has awful side effects that affected not just myself, but my family as well (a Guardian article elucidates this reality). Through this one very intensive year, I learnt lessons that no textbook can teach you about doing research – that you never only embody a single role of the PhD researcher; that you mustn’t confine yourself to just doing the PhD; but that in the end, you are ultimately human, not machine, a being with limitations and a spirit that needs to be nourished. Sure, I am a PhD student. My purpose is to conduct research and report on it. And while it is a time and life consuming endeavour, I am also many other people – a mother, a wife, a friend. However, the personal realm didn’t feature much on my very filled out Google calendar. In fact, maybe because it didn’t get penciled in, it just didn’t get done. Since the better part of the day was filled with academic, mostly mentally exhausting, activities, by the time I came home, it was pretty much leftovers for my family in terms of energy and attention. As a non-resident and non-local, building relationships with other families and peers was also important, but that simply dropped off the radar – there were no leftovers after the leftovers. And as for the fabled ‘me’ time, it was barely experienced except when I was on a plane to Wellington to attend a conference. And of course, when you do research, there is a need to communicate it to a wider audience. Conferences and publications are important academic/research activities – especially when future employment opportunities are dependant on them. While the PhD research is the central focus, there is also a need to seek out appropriate conferences and publishing opportunities. I was very fortunate to have participated in the recent ISANA Conference, a conference that nurtures doctoral students by having a doctoral consortium and encouraging doctoral students to publish refereed papers. It was also at this conference that the mantra of ‘publish or perish’ was put in perspective. 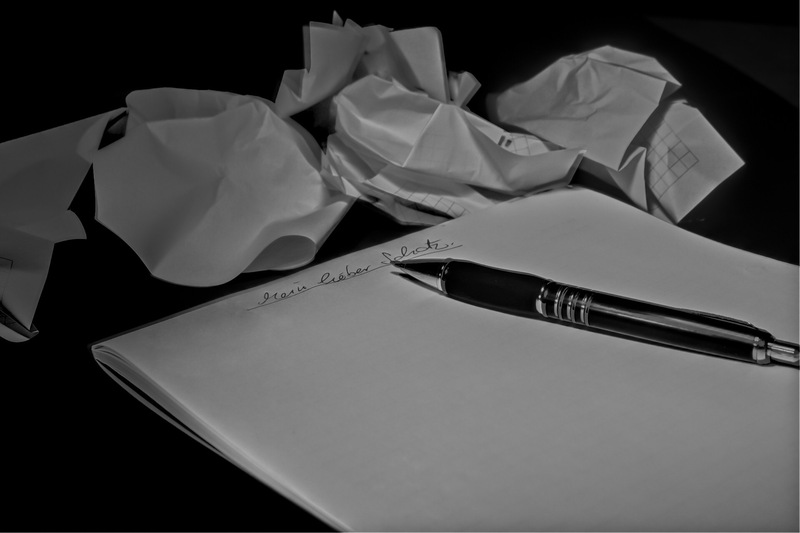 The life of an academic is one of writing – and very importantly – publishing. Getting your work reviewed by intellectual others who are detached from your work and yourself (i.e. not your supervisors and friends) builds the inner capacity to be critiqued and to respond as part of the scholarly conversation. So even though doing the PhD is demanding, it’s simply not enough to write a long and complex tome only a handful of people will read. And even if you were interested in non-academic jobs, prospective employers would still need to see you doing more than just being holed up in a room writing endlessly. So I’ve realised that I’m more than just a PhD student but the commitment to doing it is draining my energy away from important relationships in my life. I’m also convinced of the need to be a productive academic during my PhD candidature, and not wait till after the PhD. This seems to be leading to a conclusion where I resign myself to another busy year ahead and hope that family and friends will be understanding and forgive me for my lack of tenderness towards them. But I reject that conclusion. It will be another busy year, without a doubt, but it will also be a more intentional year. My intentions are not grandiose plans, but about making family time a non-negotiable part of my schedule. I’m thinking short trips with the family during school holidays. Better yet if I have to pay for the trips. I know I can’t devote the same amount and kind of energy towards friends but my lunch and coffee breaks can be planned with them in mind. I think the main challenge, however, is to have ‘me’ time that sits outside academic and personal demands. So instead of going through another intensive year with relationships dangling at the periphery, my hope for 2017 is to be intentional with my time with people who matter, and perhaps I should start with myself. It won’t be a solo trip to a mountain top, but a still morning or quiet evening in prayer. I had a supervision meeting today and I came out of it feeling encouraged and refocused. It was not simply a matter of kind words or specific directions. It was the way the conversations among my two supervisors and myself allowed one another to express, respond and reflect. I usually audio record the meeting and listen to the recording as I write up the meeting notes. In the past, I would summarise what was said and wrote it in the third person, but lately, I’ve been writing it as a conversation and using the first person instead. Although it takes a longer time to represent the meeting in this manner, I derive great satisfaction from doing so. Firstly, by replaying the meeting in my ears and mind, I recapture those aha moments, and pin down the triggers that caused particular responses. While the point might be, say, to focus on a particular research method, the conversation points that led to that are just as illuminating. By representing the exchange as a conversation, I am able to track my thought processes, and have a better appreciation of the advice given. Secondly, the thought processes that are captured in this conversation format are unique to this particular meeting. I may have considered some of these points I made in my researcher journal or in conversations with others, but the way my ideas and my supervisors’ responses are woven together do not appear anywhere else. Had this meeting not taken place, I would not have certain conclusions or convictions about aspects of my research. Finally, the ability to track my thought processes through roughly transcribed conversations, and the uniqueness of these conversations, contribute to my ongoing thinking about my research. This, to me, is invaluable for helping me shape my thesis writing. Perhaps it’s a bit strange to think of supervision meetings as reference material but I am certain that the things I have captured in conversation will inform the writing on methodology and analysis. Making time for supervision conversations is important to me. Not just a meeting to report facts and receive advice, but a space for genuine dialogue and and gentle persuasion. The international student experience is a complex one. What factors contribute to making it a meaningful one? Institutional policies and academic support are important, but so are personal attitudes and intercultural perceptions of both students and the host society. My PhD research is on international tertiary students, focusing on students from non-Western backgrounds. In the case of New Zealand, most of these students would be Asian – Chinese, South Korean, Indian. My interest in international students stems from my previous study of English language learners. I was interested in their challenges in acquiring and using the English language, and their shifting identities in the process of language learning. In the course of preparing the research proposal in the past year, however, those research interests led to other concerns. My focus of my PhD research is on international students’ informal learning practices, investigating how they engage with their peers to help them in their academic learning. In between having successfully defended my research proposal, and preparing for data collection, I’m now examining more closely the debates surrounding international students in higher education, or more commonly termed, the internationalisation of higher education, especially in New Zealand. The debates range from macro views of politics and policies, to micro issues of academic support, but are all interrelated. Three articles caught my attention for pointing out essential conditions for successful internationalisation – for both the university/country and the students. Anderson’s (2015) overview of the higher education scene in Canada, which shares similarities with the scene in New Zealand, highlights the challenges of teaching and supporting increasing numbers of international students who use English as a second or additional language (I use the terminology EAL – English as an Additional Language). Anderson raises the tension between recruiting international students as a source of much needed income, and the university’s social and educational responsibilities to students. It is the latter issue that is often debated – should international students meet minimally acceptable standards of language proficiency (and really, culturally appropriate behaviours and attitudes in the classroom and beyond), or should universities provide ample opportunities and support for students to learn the ways of the academy and increase their chances of success? Or a third, and in my opinion, a rather radical option – “establish more flexible and additive relationships with foreign students coming from non-Western academic traditions instead of expecting them to unilaterally morph into the conventions and practices of their new academic communities and discourses” (Anderson, 2015, pp. 176-177). Citing various research and offering specific examples, Anderson calls for more comprehensive and targeted academic support for international students and concludes that positive student experiences ultimately translates into better reputations for universities. While the Canadian approach appears to favour student-centred and culturally appropriate support, Jiang (2010) points out New Zealand’s “lack of intercultural policies and strategies” to respond to demographic changes in international student populations. This is not to say that universities do nothing to address international students’ academic needs, but the lack of a culture of internationalisation at the policy-making level affects funding and staffing for timely and specific support. Jiang talks about the importance of developing intercultural or international relationships. She does not discuss what it means to be intercultural, but highlights the various levels at which ‘international’ operates on (i.e. political and educational levels). In fact, none of the readings I discuss here probe deeply into what it means to be intercultural (see Byram’s (1997) Intercultural Communicative Competence (ICC) model for an in-depth exploration) – but all call for greater facilitation of students’ acculturation to the host environment. While Anderson (2015) offers an academic perspective, and Jiang (2010) a policy one, Butcher (2010) seems to suggest that societal attitudes and genuine hospitality are key to ensuring positive experiences for international students. Butcher compares different cohorts of international students in New Zealand – those from the Colombo Plan era during the 1950s and 60s and international students today. The scholars from the past were Asia’s elites; they developed close ties with New Zealanders, and vast amounts of goodwill exist between New Zealand and the Asian countries. Today’s students, in contrast, are no longer “unique or rare, [rather], their dominance in New Zealand cities is starkly evident, to the extent they have been referred to as … a ‘cultural invasion'”(Butcher, 2010, p. 12). Noting emphatically that Asia is New Zealand’s future, Butcher concludes that it is in New Zealand’s interest to invest in and cultivate networks with Asian students. The nature of new intercultural relationships require initiative on the part of the host, as evidenced in the warm reception given by New Zealand communities to the Colombo Plan students. Will friendships blossom between today’s international students and their hosts? I’m not sure if Butcher (2010) is optimistic of a change in attitude, that is, to view Asian students as important bridges to New Zealand’s future, rather than an economic resource for present needs. As an international student in New Zealand, I personally identify with Butcher’s vision for rich intercultural relationships. I also believe that these relationships are multifaceted, complex, and take time to develop and nurture. I recognise and believe in the potential New Zealand has in terms of creating a unique and valuable international experience for students. While fresh air and beautiful landscapes have always been New Zealand’s selling points, a more important experience takes place between people – people who welcome each other into their lives. The reality of intercultural friendships is never straightforward but that doesn’t mean they should be ignored. I hope my research will uncover some of the complexities of the international student experience and start new dialogues – intercultural ones. Anderson, T. (2015). Seeking internationalization: The state of Canadian higher education. Canadian Journal of Higher Education, 45(4), 166–187. Butcher, A. (2010). International students and New Zealand’s future. Journal of International Education in Business, 1(1), 9–26. Byram, M. (1997). Teaching and assessing intercultural communicative competence. Clevedon, United Kingdom: Multilingual Matters. The Postgraduate Studies Office at my university recently organised a postgraduate development workshop for students. It was a jam-packed programme with concurrent sessions covering a broad range of skills and strategies a PhD student would need in the course of his/her studies, and beyond. I chose both academic and non-academic sessions. The academic sessions I attended were on thesis submission & examination, and strategies for getting published in journals. The non-academic sessions were about careers outside academia, and career planning & interviewing skills. The highlight of the event was a mock PhD oral exam that aimed to demystify the process. I decided to do a PhD because I wanted to work at a university and be involved in research related to international students’ learning. The workshop opened up the possibility of being involved in research in a non-academic setting, such as a government agency. In a competitive labour market, PhD holders would be wise to be open to both academic and non-academic positions. I’m certainly open to non-academic positions, but I wonder if the university can create links to potential jobs and employers though internships. Getting jobs in New Zealand is often through contacts and prior relationships. Internships would be invaluable to PhD students for both academic and non-academic jobs. I’m also more aware of the need to participate in networking opportunities, although sometimes, I admit, they seem to be taking up precious time I should be using for reading and writing. And then there is the matter of keeping up with contacts, which appears to me to be fairly superficial unless there are regular encounters with them. But network I must! The session on career planning reminded me how important contacts were in New Zealand. And although I’m far from completing my PhD, waiting till I complete it to start making contacts would really be too late! I’m not about to go to very possible networking event and I can’t – my time is mostly devoted to study and family – I’m making each opportunity and encounter count by making a good impressions (hopefully!) and offering to help whenever I can. Being strategic as a student means to make the time and effort you put into your writing, reading, etc. as productive as possible. It sounds like one giant economics equation but it’s not. For me, it’s about being focused to complete tasks for the day, plan ahead, and be flexible to change things. The workshop didn’t deal directly with this but the session on being productive in writing and submitting journal articles led me to think that it is about having focused and practical plans that will lead to results. I’ve just completed the first milestone of my PhD – confirmed enrolment. And in the past few days, I’ve been refocusing my thoughts and energy towards getting ready for data collection, and making plans about what reading and writing I want to do. As the year draws to an end, I’m glad there’s the summer holiday to relax and recharge for the journey ahead. The PhD journey is often said to be lonesome. For those starting the journey or planning to, I can assure you that this is not an exaggeration. Part of making the PhD journey a meaningful one is to connect with others. Here are my top three tips for ensuring that your PhD journey isn’t a lonesome one. Usually, there are activities organised for doctoral students, whether at the university or faculty level. At my university, such activities include regular writing workshops, topical seminars and social lunches. My experience is that while many PhD students are often holed up in their offices, they do attend these activities, especially when the topic is a practical one for their study. If you keep saying you don’t have time for other things apart from studying, think about how these activities will enhance your research. Plan your time well so that you can make time to broaden your perspective, and at the same time, meet other people. When you attend an event or participate in an activity, do you meet new people? Or do you gravitate towards people you already know? If you do the latter, I guarantee you that your circle of friends will remain as small as it started! I believe that networking, or making new contacts, is important for a PhD student. Knowing fellow PhD students from your faculty is important, but so is getting to know students from other faculties, and also people who are not PhD students. Establishing a network of contacts is especially important in New Zealand where careers are built on networks and relationships. For me, knowing people from different disciplines and areas of work helped me to understand the university better. At times, they also provided different perspectives on an issue I was looking at. If you find that there aren’t many activities to join in the first place, or any chance for networking, then here’s your opportunity to create them. If there’s a student association for doctoral or postgraduate students, why not join the committee and help organise activities that other students will find useful? Or perhaps speak to a staff member at your faculty who oversees PhD students? Perhaps make suggestions on how the faculty can help integrate PhD students better? Personally, I have done both. I am a fairly sociable and outgoing person, and yet, I felt isolated and disconnected when I started my PhD, especially in the first few months. While there were several activities happening on campus and at my faulty, I felt more could be done to foster a sense of belonging for PhD students. I now actively advocate for, and contribute to, a community of doctoral students. Don’t believe that you are meant to be on the PhD journey alone. Whether or not you are an extrovert or introvert, having meaningful relationships with peers and others is an important aspect of your scholarly pursuit, as well as part of a well-balanced life. “Discourse Analysis beyond the Speech Event” by Stanton Wortham and Angela Reyes is about using a new approach to discourse analysis that draws primarily from linguistic anthropology. It emphasizes the importance of analyzing the pathways across linked events in order to understand social processes such as learning and socialization. The authors argue that “[i]n order for discourse analysis to be a useful method for studying social processes …, it must uncover how people, signs, knowledge, dispositions and tools travel from one event to another and facilitate behavior in subsequent events” (p.1). The intended audience are students and researchers who are already familiar with discourse analysis. The authors clearly present the tools and techniques of discourse analysis applied to a range of data including data from classroom observations, historical artifacts, and internet-mediated communication. 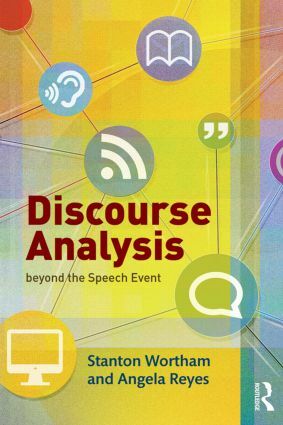 Chapter 1 ‘Discourse analysis across events’ introduces the approach to discourse analysis through an example from a ninth grade classroom of mostly African-American students in an urban American high school. The authors make a distinction between the terms ‘narrated event’ and ‘narrating event’. Narrated event is what is being talked about, and narrating event is the activity of talking about the event/s. For example, interactions among students and teacher make up the narrating event, while the topic of discussion is the narrated event. The narrating events that are linked through recurring patterns form a pathway in which the analyst examines patterns within individuals events, and across linked events over time. Through several segments of classroom interaction, the authors introduce key terms used to analyze discrete events, as well as the steps to examine patterns across events. Some of the key terms include indexicals, voicing, evaluations, positioning and actions. The authors show through their analysis how social action is accomplished through language use – and in this case, how teachers and students exclude and discipline a particular student. Thus discourse analysis across speech events combines within-events and cross-events analyses to understand social processes such as learning. Chapter 2 ‘Central tools and techniques’ elaborates on the authors’ approach to discourse analysis. This chapter clarifies the authors’ primary focus on “how participants establish relationships with others, they position themselves interactionally, perform social actions and evaluate both others and the social world” (p. 41). The authors elaborate on the three phases of discourse analysis. Phase 1 focuses on mapping narrated events, which means identifying characters, objects and events that participants refer to as they speak to one another. In order to map a narrated event, the analyst needs to look at grammar, lexicon and the sociocultural context. Phase 2 is an iterative process of establishing the meaning of signs through selecting, construing and configuring indexicals. Finally, in Phase 3, the analyst engages in drawing conclusions about the positioning of participants and interpreting the social action occurring in the narrating event. Phase 2, in particular, employs concepts found in linguistic anthropology such as voicing (Agha, 2005), entextualization (Silverstein, 1976), and enregisterment (Agha, 2007). The chapter illustrates the procedure for discourse analysis with different classroom examples, this time, focusing on instances of crying ‘racist’. Through the analysis, the authors demonstrate how understanding the sociocultural context of crying ‘racist’ in the mass media, and linking it to the analysis of the classroom events, lead them to the conclusion that the instances are best understood as being humorous instead of serious. Chapter 3 ‘Discourse analysis of ethnographic data’ applies discourse analysis to ethnographic data such as interview transcripts, recordings of naturally occurring events, and documents. In using discourse analysis on ethnographic data, the goal of the researcher is to record potentially linked events over time and across different settings and subsequently “identify which events are in fact linked into pathways through which consequential social action occurs” (p. 73). The chapter refers to two ethnographic case studies in which data was collected from classroom settings over a period of one year. Analysis was based on transcribed audio recordings of classroom events, and supported by the researcher’s observational notes and sociocultural meanings of the classroom and the broader context. The challenges of using ethnographic data to conduct discourse analysis across speech events are i) the researcher must record numerous events in the settings being studied over an extended period of time; and ii) the researcher cannot tell in advance which events are significant although he/she can predict certain topics that might be relevant in the long term. The authors stress the importance of collecting as much data as possible as the analysis is dependant on “pathways of linked events that together accomplish social actions” (p. 109). In Chapter 4 ‘Discourse analysis of archival data’, the author’s model of discourse analysis is applied to archival data used in two existing discourse analytic studies, one on Japanese women’s language and the other on Irish English accent. The archival data used in the studies differed in their sources. While much of the data was taken from print media, including visual images, in one study, three books were referred to in the other study. The authors thus demonstrate that discourse analysis beyond the speech event can be applied to a wide range of data sources from historical materials. Drawing from material used in the study on Japanese women’s language, the authors present a pathway across three narrating events across a long temporal space; the three events were based on publications dated 1888, 1907 and 1908. While separated by historical distance, the events share several features such as referring to the same linguistic style spoken by Japanese schoolgirls, characterizing such speech negatively, and giving similar historical accounts of where the speech originated and how it spread. In a subsequent set of events, the authors similarly demonstrate how the negatively evaluated linguistic style took on a positive meaning as seen in print advertisements from the 1910s, 1920s and 1930s. In analyzing the material used in the study on Irish English accent, the authors trace a pathway of four events from publications of 1802 and 1910. Focusing on evaluative indexicals and voicing in the data, the authors demonstrate how speakers of Irish English who make language and pronunciation mistakes are contrasted with superior speakers who do not make such mistakes. The authors further conclude that the readers of the publication are invited to align themselves with the superior characters and make fun of the mistakes. In two events taken from contemporary publications, the authors similarly analyze how Irish English is construed as ignorant and humourous, again pointing out that readers of the publications are enlisted to laugh at the mistakes. The authors point out some key differences between analyses of ethnographic and archival data. In ethnographic studies, participants are often the same in different narrating events. In archival data, because of the historical scale, participants often change from one event to another. In addition, ethnographic studies focus on relatively few linked events in a pathway, while archival studies involve a larger set of events. Thus the challenge of engaging in discourse analysis of historical artifacts is to choose events from a very large set of potentially relevant events. Chapter 5 ‘ Discourse analysis of new media data’ focuses on discourse analysis of new media such as email, blogs, and social media such as Facebook, Twitter and Instagram. The authors apply their model of discourse analysis to recent studies of new media, one focusing on a YouTube video and the comments posted in response to it, and one that traces the recontextualization of stock storyline elements in music videos. The case study on a YouTube video and its comments focused on how the YouTube performance indexed African American culture or ‘blackness’, and how the subsequent comments demonstrated whether viewers aligned themselves with the performer or not. Using data from the case study, the authors highlight the indexical cues that take the form of nonstandard pronunciation and orthography, emoticons, and abbreviations that contributed to an understanding of the viewers’ attitudes toward the YouTube performer’s interpretation of blackness. In the study of storylines in music videos, the authors focus on the comparison of two music videos that employed stock storyline elements. In the analysis of videos, images and non-verbal communication form a substantial part of the data. The authors make two important points about the music videos. One, the use of stock storylines demonstrates how the two videos establish a pathway across a genre of music videos, and yet differ in their treatment of the storyline elements. While one video simply replicates the the stock storyline, the other creates self-reflexive distance by “juxtapos[ing] stock and contrasting elements to produce ironic commentary” (p. 169). This analysis is further supported by the commentaries on the videos. Two, the self-reflexive music video and the previous YouTube performance video on blackness together form another pathway that “perform ‘ironic blankness’ and position themselves as clever and self-aware” (p. 169). These two different pathways thus show how discourse analysis beyond the speech event can account for media that are separated from one another in time and space. A productive approach that can be employed in different ways for different data. The rest of the chapter goes on to elaborate on their primary contributions. The final point made by the authors is that their approach to discourse analysis beyond the speech event circumvents the issues surrounding conceptualizing discourse analysis as focusing on either micro or macro processes. Instead, discourse analysis beyond the speech event “uncover[s] intermediate-scale regularities that take shape across pathways of linked events, … allow[ing] us to capture the heterogeneity of relevant resources from various scales” (p. 182). The authors of “Discourse Analysis beyond the Speech Event” have achieved their goal of communicating a systematic method of discourse analysis by detailing the processes and demonstrating how their analytical approach can be applied to different types of data. What was most impressive about the approach was its productivity across dissimilar data (i.e. ethnographic, archival, new media) and contexts (i.e. classroom, history, internet communication). The intended audience is supposed to be advanced students and researchers working in the area of discourse analysis methods. Since discourse analysis spans various disciplinary fields, and the authors adopt particular analytical terms, readers may find the book on the outset somewhat alienating if they are not familiar with the particular terms used. However, the authors take care to define key terms and illustrate the use of such terms through examples and thorough analysis of the examples. Students and researchers with a background in linguistic anthropology will probably be more familiar with the concepts and terms used since the approach is based on linguistic anthropology. Overall, the authors present a robust methodology that aims to uncover how participants accomplish various social actions. It is hoped that future research employing discourse analysis will consider what the authors have to offer. Agha, Asif. 2005. Voice, footing, enregisterment. Journal of Linguistic Anthropology 15(1): 38-59. Agha, Asif. 2007. Language and social relations. New York: Cambridge University Press. Silverstein, Michael. 1976. Shifters, linguistic categories, and cultural description. In Keith Basso & Henry Selby (eds.) Meaning and anthropology, 11-55. Albuquerque, NM: University of New Mexico Press. This review was originally published on The Linguist List. They say this 3-year solo flight of a PhD journey is one fraught with anxiety, self-doubt, and a lot of other negative stereotypical emotive words, whether related to the student, supervisors, and the monster called Thesis. I’m an idealist. When I embarked on my PhD studies, I made up my mind to make it a positive experience, no matter how I felt, with whatever resources I had. 9 months into the journey, flight, any metaphor of your choosing, I’ve had to deal with those stereotyped feelings and emotions, whether it was from me, or proffered by others. 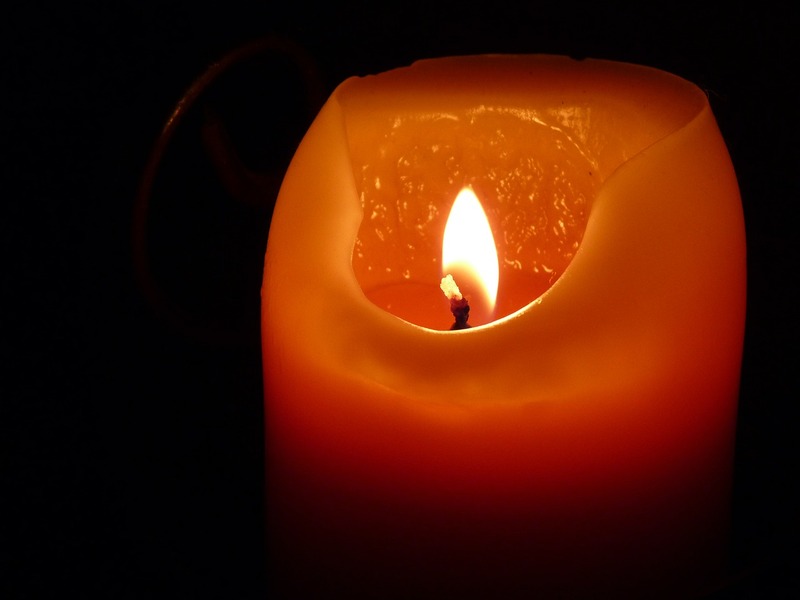 Was my candle snuffed out for good? Did my grand ideas and ambitions count for nothing? Had my idealised vision of an emergent scholar come to terms with reality? I was tempted to admit defeat and claim the messiness and roller-coaster emotions as normalcy, but I couldn’t, and didn’t. A particular incident prompted me to reflect deeply about what I’ve been through. I talked to others, considered my options, and was in between feeling resigned to my fate, and feeling indignant about my situation. Then I took up the advice of a senior PhD student who had gone through a similar situation. One action led to another, and these actions opened up possibilities. 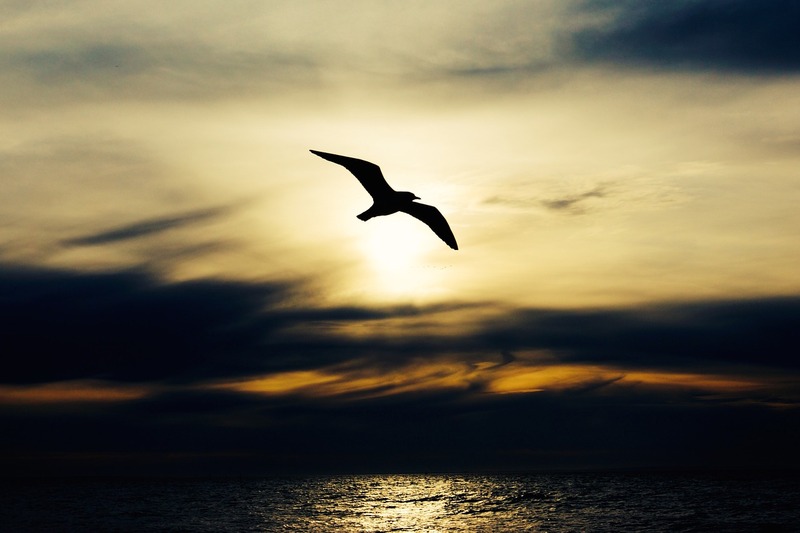 Through the process of exploring what I could do, I managed to step away from myself, my situation, and considered things in a less emotional and more critical and objective manner. It helped that I was away for a few days in Wellington for a student conference, and that experience also helped re-framed my outlook on my PhD. I’ve taken steps to move away from self-pity, and to create a more nurturing environment where I believe my ideals need not be be displaced, but work alongside the twists and turns of PhD life. I do not discount the effects of academic isolation that a 3-year PhD model brings, but I do not believe the PhD student needs to buy into the narrative of doom and gloom. My PhD studies were motivated by sociopolitical ideals and personal goals. I’m not about to let the dream fade into a distant memory.